Back in 2005, I don’t think that many people had high hopes for the Fantastic Four video game. Sure, it was a movie game and yes, the movie it was based on was received tepidly at best, but in hindsight there was a reason to be optimistic somewhat about it, and I can’t believe I’m going to say this, it was because the publisher was Activision. While today we look at them as the destroyer and milker of annual franchises, in 2005 they had a decent track record when it came to licensed games, especially Marvel ones: They reignited the Spider-Man video game series on the PSOne and were just coming off of 2004’s Spider-Man 2; They also had some decent X-Men fighting games in their portfolio and extended that brand further with the excellent X-Men Legends. Really the issue plaguing Fantastic Four is that it had perhaps some lofty expectations set by other successful Marvel super hero games combined with a stigma towards movie games. I missed Fantastic Four back when it came out because I was never that big a fan of the characters, and I’ll admit in playing it this year I came away somewhat pleasantly surprised for what it was, but while I had fun, it never reached the dizzying highs of Activision’s other super hero games. 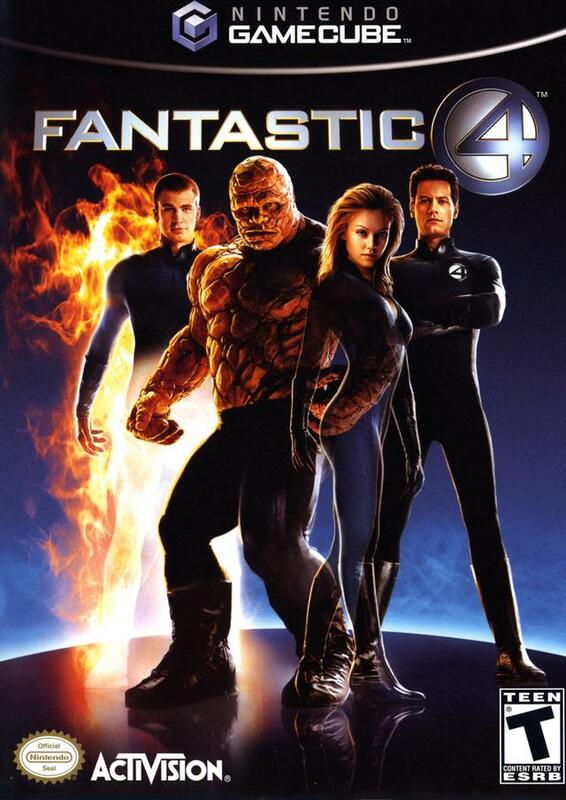 Fantastic Four like many a movie game follows the plot of the 2005 film with the group getting their powers and then trying to find a cure for them, eventually leading to a show down with the groups arch-nemesis, Doctor Doom, but it expands that simply story with sub plots involving villains like Mole Man, Dragon Man, and Annihilus. An interesting and unexpected development in the game that differs from the movie is that the origin and development of the Fantastic Four’s powers are being monitored by S.H.I.E.L.D and they run into Nick Fury more than once through the course of the game, and it gives it a pre-Marvel Cinematic Universe Easter Egg feel. Unfortunately what really kills the story segments are some really shoddy full-motion videos. Normally an issue with games of this era is that the game looked really bad when it came out of a movie, like a lot of Square-Enix RPG’s, but Fantastic Four has the opposite problem in that the game has some decent graphics but the FMV’s are flat-out ugly. Poor videos aside, A contributing factor as to why the story is a step above other games of this type is that it was penned by Zak Penn who is credited with some good super hero films (X2, The Incredible Hulk, The Avengers). The major players of the film all lend their voices and while sometimes that’s not always a good thing, just listen to Ed Norton nearly fall asleep while reading his lines in The Incredible Hulk (2008), they all do a good job with the exception of a few lazy line delivers from Jessica Alba. What really takes some getting used to playing this game now is hearing Captain America’s voice coming out of the Human Torch. 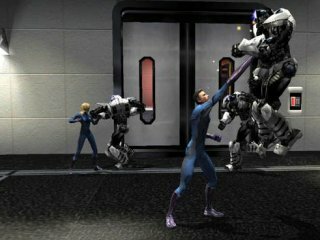 Like the ill-conceived 1997 PSOne Fantastic Four game, this game is more or less a 3-D brawler but it’s a pretty fun one. In single-player mode you’ll normally have two members of the team to switch through by simply hitting their corresponding direction on the directional-pad, with the full team being together reserved for the boss encounters. What’s a shame is that co-op is available but for two-players only; a missed opportunity for a console that has four controller ports and a team that has four characters. Maybe this was to be fair to PS2 owners as I don’t recall anyone owning the multi-tap, but even the PSOne game allowed four players at the same time. Each member of the team has some easy to pull off combos that feel satisfying and are given to you at a good pace as to not overwhelm you with screens after screen of moves to learn. One combo for example is good for enemies who shield themselves while another will deplete a smaller enemies life completely and they all become available only when necessary. What makes it easy adapting to all characters is that they all share the same move set so you won’t have to relearn a new set of combos when you’re in a stage where you’re required to switch characters. The same can be said of the super movies which are all easily pulled off by holding the Z-Button as a modifier and hitting either the A, B, or X buttons. All combos and super moves can be leveled up by collecting currency obtained by smashing things in the environment or by defeating enemies. The super moves, combos and character switching give Fantastic Four a feel like X-Men Legends, which is not surprising given the games come from the same publishers, and I wish that developer Seven Studios had gone even farther in that direction. As good as Legends is, it got somewhat repetitive and that was greatly diminished by the thrill of leveling up your characters and getting new loot. You do level up combos and super moves in this game as well, but without the RPG elements found in Legends, it can get mind-numbing after long play sessions, and as easy as it is to control the team, they rarely feel that unique from one another. You’ll need Mr. Fantastic to hack computers via a pointless line up the rings hacking mini-game and the Human Torch to weld objects and open doors, but when you’re just fighting waves of enemies, the ever-loving blue-eyed Thing doesn’t feel that much different from the Invisible Woman. 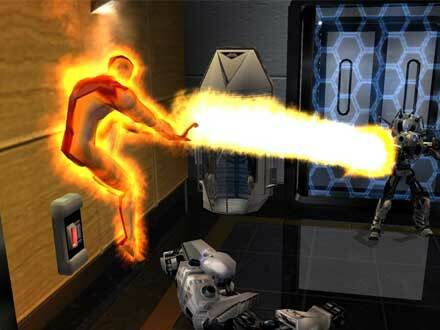 What this game really needed was some instances of more unique character moments like a flying level with the Human Torch for example, as he only ever hovers, or a full on stealth segment with Sue Storm. In fairness the game does do a basic tutorial where you can stealth kill enemies with the Invisible Woman, but it’s never required outside of that basic introduction. What this game also could have benefitted from greatly was stealing the camera perspective of X-Men Legends. In Legends the camera was positioned overhead and but in Fantastic Four it puts you right in the action with your characters. You can manipulate the camera with the C-Stick and generally you can see what’s happening, but too frequently your perspective will become obscured at an inopportune times. This is perhaps worst in the boss encounters when you have to not only contend with a giant enemy, but a pile of little ones as well and you’ll lose sight of the boss. There is a lock-on mechanic, activated by holding down the L-trigger, but it’s never ideal and always focuses on the enemy you don’t want to. Fantastic Four isn’t a terribly long game, I finished it in under a week in only a few play sessions here or there, but there is some replay value to be found. Every level presents an extra challenge for you to complete like not losing any lives or refraining from using super moves and these not only give you more currency to spend on character upgrades, but unlock arena survival challenges as well. Completing the game on the normal difficulty also unlocks a cool bonus level where the team resembles their look from the Ultimate Fantastic Four comic and even have different voice actors. The goal of the bonus level is to invade Latveria and it was an addition wasn’t expecting. There are two of these levels, the other unlocking when you finish the game on hard, and while I didn’t have that much difficulty with the game on normal, I would maybe refrain from starting on hard as this game is one of the generous ones where you can replay levels on a higher difficulty with all of your earned upgrades. While this game is not as fantastic as the groups namesake, there’s enough good in the package to recommend this game to either a fan of the comic or for anyone looking for a fun co-operative brawler. I do think this game would’ve been a better fit as an X-Men Legends clone as with some of that game’s DNA infused into its design could have helped with some of the repetition and differentiating the characters more, however the story, unlockables and easy to pick up gameplay rise it above your average movie game. Fantastic Four is far from being a must play game, but if you can find it at your local game shop or online for cheap, it’s worth a look. I get the feeling from your review that playing Marvel Ultimate Alliance with a team consisting of the FF might actually make for a better Fantastic Four gaming experience. Especially since you said that the FF game could benefit from the mechanics of X-Men Legends, which MUA has in spades. Somehow I feel like Marvel Ultimate Alliance is simultaneously the best Avengers and Fantastic Four game so far. That would be a pretty fair statement, actually. And if it weren’t for the Doom-centric story, MUA might also be the best X-Men game as well, if it had more X-Characters, since it was more polished than Legends 1 and 2 in almost every way. See I liked the Legends game more than either of the MUA games. Maybe it’s because I’m a sucker for cel-shaded graphics. I thought they MUA games looked really bland and generic, too Unreal-y.